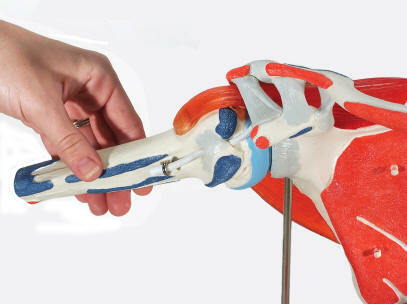 Also See: Functional Shoulder and Elbow Models as they show ligaments. 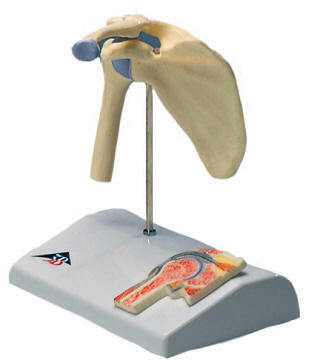 All of the models on this page are also available as part of Joint Sets..
Semi-articulated right rotator cuff model has an encapsulated humerus that is removable from the capsular ligament of the shoulder joint. This allows demonstration of the rotator cuff's role in both fixing the humerus in the glenoid cavity and depressing it during elevation. 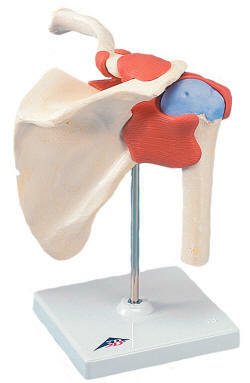 Model includes a removable patient education card and plastic base. 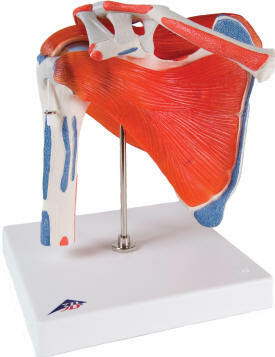 This model comprises the upper half of the humerus, the clavicle and the shoulder blade. 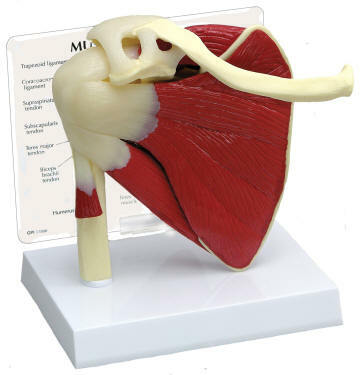 The muscles of the rotator cuff (subscapularis muscle, supraspinatus muscle, infraspinatus muscle, teres minor muscle) are displayed and the sites of origin an insertion of the shoulder muscles are highly in color. (origin in red and insertion in blue). 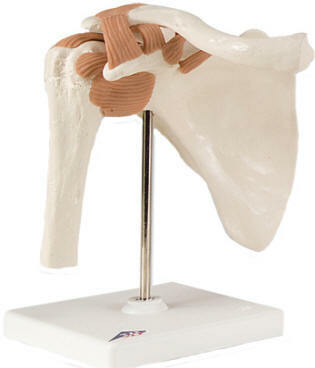 By removing the four individual muscles all movement of the shoulder joint can be performed. : abduction, adduction, inward rotation, outward rotation, anteversion (forward lifting of the arm) retroversion (backward lifting of the arm), elevator (lifting the part above the horizontal plane and circumduction (combination of all movements "arm circles." Mounted on a base.